In February 2019, DRT2019 continues to grow from a one-day event to a three-day festival, celebrating everything that represents the Porsche brand. Show-goers can expect to witness a wide selection of daily drivers, ultra-rare models, and historical Porsche race cars along with great live music, food, and parts vendors. Born in 2015, Das Renn Treffen follows in the wake of VolksBlast (VOLKSBLAST.COM) – a nearly 20-year- old Vintage Volkswagen Show that was formed by members of the Palmetto Bugs and Wide Five VW car clubs. Originally created to help raise funds for local charities, many of the members who also donated time building houses for Habitat for Humanity realized what an incredible impact an official show could have on the community. VolksBlast had its first show in 1998 in the First National Bank of South Miami parking lot and drew 60 participants and over 100 spectators. Today, the show plays host to over 450 vehicles and 10,000+ spectators from all around the country and has helped to raise over $120,000 since it’s inception. Entering its third year, Das Renn Treffen is quickly becoming the largest and most anticipated Porsche event on the eastern seaboard. Attracting those who’s hearts beat faster at the sight of the Porsche crest, along with their friends and families, the future of Das Renn Treffen is bright. generating more than $120,000 for local charities over the last 17 years....and counting. 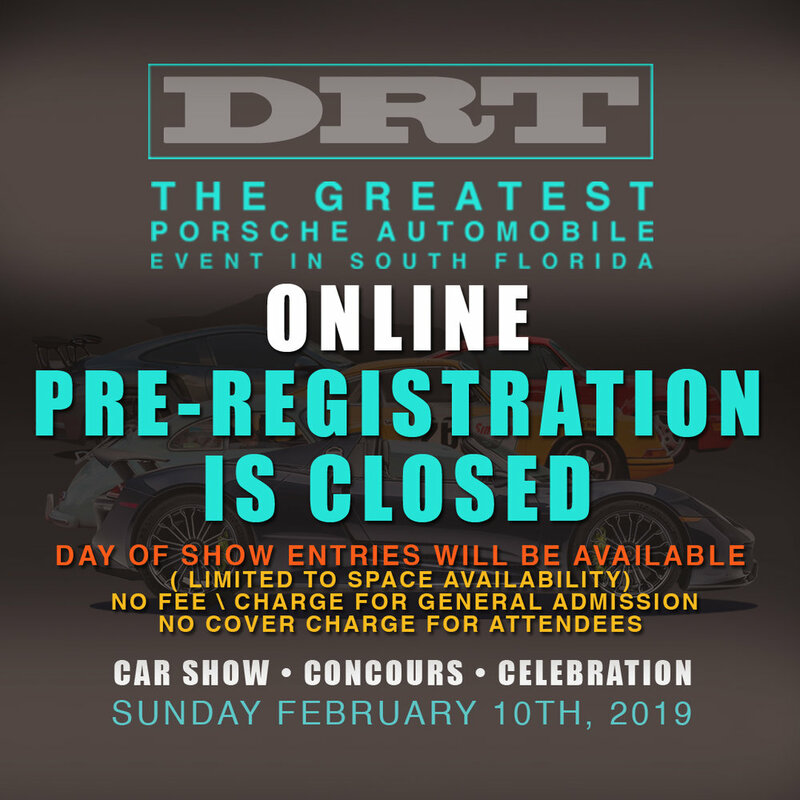 With more than 500 Porsche automobiles honoring the Porsche design concept that design follows function, DRT attracts enthusiasts from around the world and doubles as a community fundraiser for local charities and non-profit organizations. In February 2019, DRT2019 continues to grow from a one-day event to a three-day festival, celebrating everything that represents the Porsche brand. Show-goers can expect to witness a wide selection of daily drivers, ultra-rare models, and historical Porsche racecars along with great live music, food, and parts vendors. While the precious steel is always a sight to see, the amazing community that comes together to share their stories and passion of the Porsche brand is what has made DRT such an incredible success. 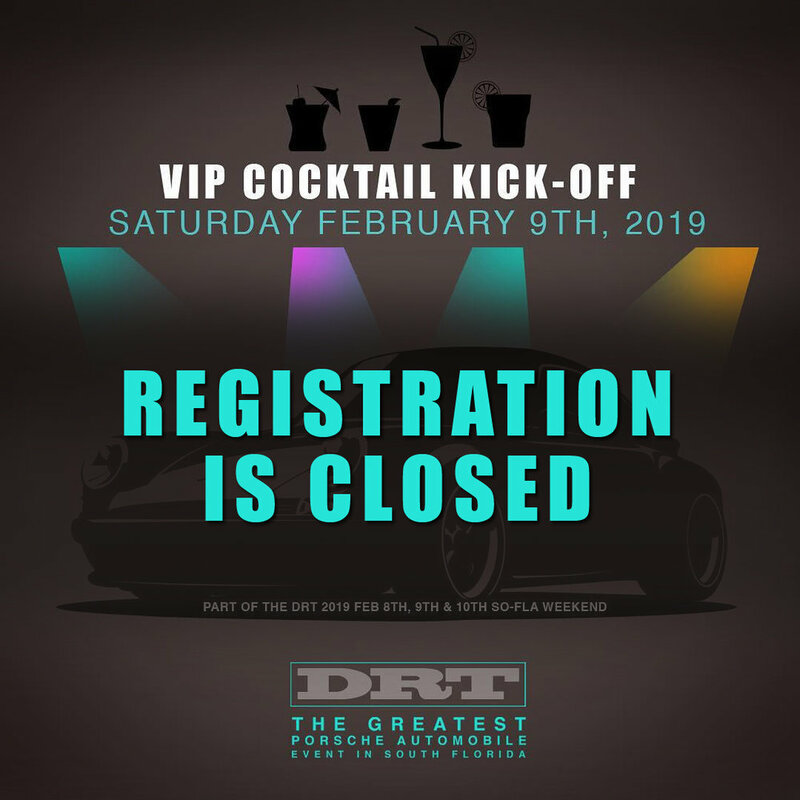 Recognizing automotive greatness and helping to support local charities and non-profit organizations is truly what DRT is all about. We’re looking forward to seeing you there. Please help us make this a fun, successful and rewarding event by supporting us as a sponsor, by registering your Porsche for the Car Show, participating as vendor, setting up a display booth at the event or by making a donation. For Event information or to register your Porsche do not hesitate to contact us today. Das Renn Treffen is not sponsored, associated, approved, endorsed nor, in any way, affiliated with Porsche Cars North America, Inc., or Dr. Ing.h.c.F.Porsche, AG (www.porsche.com) The Porsche® name and crest are trademarks of Dr. Ing. h.c. F. Porsche AG, and any other products mentioned in this Website are the trademarks of their respective holders. Any mention of trademarked name or other mark is reference purpose only in the reaching a Porsche enthusiast, owner, collector, driver, builder, technician or aficionado for the purpose of event, car show, display, exhibit, festival, gathering etc. Copyright / trademark infringements are not intended, or implied.